Craig is joined by guests actor Adam Goldberg, comedian Noel Wells, and Ty Pennington as they debate and discuss history's greatest man-made structure. As much as I have enjoyed Craig Ferguson on the Late Late Show for many years, this show is a disaster. As other reviewers have noted, when they refer to "history", apparently doesn't mean the roughly 5 or 6 thousand years of human history, but mostly the last 20-30 years. Heaven forbid, if you go beyond that, the show might descend into something intelligent and meaningful. For the most part, the guest panelists generally try to make an effort to stay on topic and seemingly did some research on their own, but it just degenerates into gibberish thanks to Ferguson's interjections and the arbitrary selection and elimination of candidates for the show's topic. I realize the show is meant to be entertaining and light- hearted approach to introducing history and not a documentary, but this is not the way to do it. 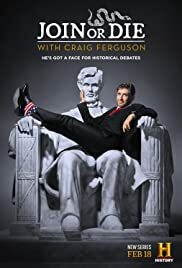 I just hope no one watching is ignorant enough to think that this is a good way to be introduced to "history", never mind think that this show offers a coherent, thoughtful analysis and comparison of the historical figures mentioned in the show. In summary, the perfect show for the under-educated who can't spend more than 20 minutes to actually learn the real history behind the important figures introduced on the show.